Maid Marian was built in 1903 and delivered to Dinorwic where it worked until 1964 when she was withdrawn from service. In 1965 a group of enthusiasts clubbed together, formed the Maid Marian Locomotive Fund (MMLF) and bought the loco for preservation. Maid Marian has been on the Bala Lake Railway since 1975 has the frames and many of the numbered parts of King of the Scarlets (HE 492 of 1889) due to the works at the Dinorwic Quarry swapping components around when major overhauls took place. Late in 2004, Maid Marian was withdrawn from service and stripped down so that a new boiler could be made. This work, entirely paid for by members of the MMLF was completed by end of 2006 and the loco was rebuilt in the Llanuwchllyn workshops of the Bala Lake Railway, re-entering service 28 May 2007 resplendent in the colour scheme she carried while at Dinorwic. Maid Marian was withdraw for overhaul again in 2016 and was returned to service in Spring 2017 in her original cabless form with dumb wooden buffers, to celebrate the 50th anniversary of her purchase from the Dinowic quarry by the Maid Marian Locomotive Fund. The history of Maid Marian has been a convoluted one, and any attempt to summarise it must take into account the fact that the frames and many of the number-stamped parts of the original Hunslet locomotive 822 of 1903 as bought by the Quarry are actually at the back of a barn in Canada. The loco that was bought by the Maid Marian Locomotive Fund in 1965 and which has been on the Bala Lake Railway since 1975 has the frames and many of the numbered parts of King of the Scarlets (HE 492 of 1889). The reason for this was that the Dinorwic Quarries, as did other large industrial users of steam locomotives, regarded their locomotives as industrial plant and swapped components around when major overhauls took place, often when boiler replacements were made. The saddle tanks with their attached name plates would be placed on the completed loco after the rebuilding had taken place, though they might not necessarily be on the set of components that carried the name previously. Those who would like further detailed information and discussion will find much more in Cliff Thomas‘ excellent book Quarry Hunslets of North Wales. 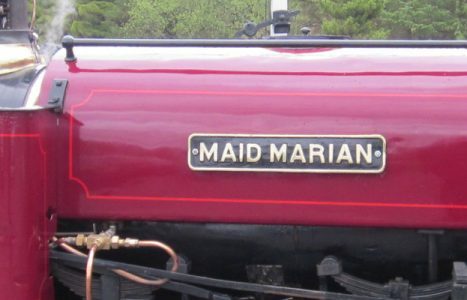 Maid Marian was originally called No.5 and had a domed boiler, unlike many of the other locos in the Alice class. The Assheton-Smith family who owned the Quarry started naming the locos after members of the family but after 1911, when Charles Assheton-Smith was created a baronet, the locomotives were named after winning racehorses he owned. This accounts for the many decidedly un-Welsh names of the locos in the Dinorwic stable! Maid Marian worked on the Dinorwic village line, also known as the Allt Ddu Tramroad, until 1928 when she was replaced by Lady Madcap; somewhere in the early 1930s came the complicated series of rebuilds and swaps that finished up with the present day Maid Marian having a domeless boiler. This boiler was replaced in the early 1950s and has remained with the loco until now; the Maid Marian Locomotive Fund, which has owned the loco since 1965, is seeking ways of raising money for a rebuilding this boiler (see elsewhere in this website for further details). By 1964, Maid Marian, along with Bernstein and Rough Pup, was stranded on Pen Garret Level by an immense rockfall that cut the main face of the Quarry in two. Founder members of MMLF visited the Quarry after making preliminary enquiries and were informed by Tommy Morris, the then Engineer, that Maid Marian was the best of the existing locomotives on sale. Maid Marian‘s first photo opportunity under the new future management took place after being winched out of the shed into the sunlight after many years in the dark; an oily rag was produced to shine up the sides of the tank and cab nearest to the cameras! All three locos were brought down from Pen Garret by the Quarry and the “Maid” was overhauled and repainted in the purchase price. The hand-over ceremony took place in Llanberis in 1967, with Maid Marian heading a train of wagons and yellow coaches (see Picture Gallery Page) the length of the Peris-Padarn tramway. Shortly afterwards the MMLF moved the loco to the Bressingham Steam Museum in Norfolk, having briefly toyed with the idea of taking over the railway that ran up the side of Longdendale reservoirs. This would have been a local venue for the founder members, all of whom at that time lived in the Manchester area, but external advice given to the Fund indicated that owning a locomotive was one thing, but running a railway was quite a different matter! From 1967 to 1971, Maid Marian ran around the Bressingham Gardens and provided the Fund‘s members with the experience of driving the loco on a passenger train, but the journey between Manchester and Norfolk was not an easy one on a regular basis. An opportunity of returning the loco to North Wales was too good to be missed as the Llanberis Lake Railway. was being opened following the final closure of the Quarry and the sale of the remaining locos and parts. Arrangements were made to return the “Maid” home to Llanberis for use on the line, though before this could happen a number of modifications were needed. Many of these were carried out by the Fund members, the most obvious being the fitting of a cab, but although the loco was cleared for use on the line, very few passenger trains were run. The Railway had 3 of its own locos from the Quarry so there was little need for the additional loco. Maid Marian was finally moved to her present home in Llanuwchllyn, on the far end of Bala Lake from Bala itself, in 1975. 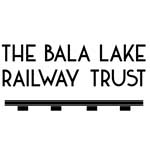 At last the steam engine without a railway was united with a railway without a steam engine, as the Bala Lake Railway (BLR) did not have any steam locos at the time. The arrangement seemed to suit all parties admirably and since then she has shared the locomotive roster with Holy War, another Hunslet loco from the same Quarry, and has been an integral part of the Llanuwchllyn scene. The original agreement with the Railway was on an annual basis for a number of years, as had been the practice with the Bressingham and Llanberis operations. However, after a period of internal debate about the future of the Fund and the long-term placement of the loco, the Trustees opened the Fund up for new subscribers and negotiated a new 10-year agreement with the Company. This gave greater stability to both parties and is due to be re-negotiated in the near future so the MMLF is looking forward to the next century of operation from Llanuwchllyn. More details of the Dinorwic Quarry and other locomotives can be found in “Slates to Velinheli”, written by Douglas Carrington a founder member of the MMLF, and available in its 3rd reprint (see the fund website for further details).